Try a wine and savour all the authentic taste of a remarkable territory. breathes the charm of the Gulf of Amalfi. Don’t look for a ring of houses standing round a square here. You won’t find it. Furore, the village that isn’t a village, with its houses scattered on the slopes of the mountain, dropping sheer down to the sea, offers tiny samples of itself, allowing itself to be discovered with flirtatious bashfulness. You will walk along paths and “petingoli”, squeezed between small plots of land claimed miraculously from the rock and cultivated with age-old love, almost stubbornly. You will drink fresh and lively wines – both red and white, “capable of filling you with all the sunshine and joyfulness possible”. You will admire vineyards and gardens, terraces and pergolas, hillocks and bending roads that plunge down to the sea. And walls: dry stone walls, painted walls, illustrated walls. Speaking walls. Artistic walls. And churches, tall bell towers and Arab-influenced domes. A vortex of panoramas bathed in silent light, suspended, unreal and secret, just like a fairy tale. You will listen to the silence. You will capture the breath of the universe in the distant voice of the sea. You will sense the perfume of myth in the breath of a nymph who’s in love and has always inhabited these ravines. You will live in a dreamy, yet disturbing atmosphere, where every glance is an emotion and every thought a dream. Vines cultivated on the Divina Costiera unite land and sea. Furore, its vineyards and the start of an adventure for Marisa Cuomo and Andrea Ferraioli: the story told by Luigi Veronelli. Do you remember the young woman and two or three kids on the pitiless cliffs that rise up from the splendid sea on the Coast, up, up into the rocky gorge known as Gran Furor? In the 1960’s they made two white wines. “…from Ripoli, Fenile, Moschella, Peppella and Ginestra grapes; one is an amber white wine, the other a parchment white or white gold wine, both characterised by a delicate aroma. Subtly sweet, the first is denser, the second finer”. Marisa and Andrea (possibly two of the kids?) now make Fiorduva.....in the cru area of the municipality of Furore, Costa d’Amalfi doc. This wine is more commonly known as Gran Furor Divina Costiera Bianco. “A passionate wine filled with the essence of rock and sea, without even the slightest hint of sweetness”, is what I wrote last year. I have walked in the vineyards, as I intended, and tasted the 1998 wine again. A masterpiece of magical balances and spontaneous aggressions, due to the joint desires of the two winemakers and a princely oenologist (who could it be, if not Luigi Moio, in a town called Furor?). Terra Furoris: fury of the sea against the rocks. Furore, an extreme yet beautiful fjord, keeps the secrets of an excellent winemaking tradition. Furore disorientates bishops and politicians. They come here to preach and for their rallies. “Where’s the town?” It’s scattered like a fistful of confetti through pergolas and lemon groves that descend from the 500 metre-altitude of the cellar to the Fiordo, a romantic bay on the Amalfi Coast. Vines on the rock face: they grow horizontally, they lie on rock and soil that plunge down towards the sea, in the world’s most arid and generous agriculture. From the Gran Furor Divina Costiera, Andrea Ferraioli has created “Cantine di Marisa Cuomo”, a delightful thought for his wife on their wedding day. Costa d’Amalfi Doc. A freshly aromatic white and a reserve red which linger in oak barrels. Quality and lust for life. Luigi Moio, the oenologist and poet, has added a touch of nobility. Gerhard Schroeder, German chancellor on holiday, discovered it in Positano and flooded Bonn. For those who love the Amalfi Coast, these wines are emotions. 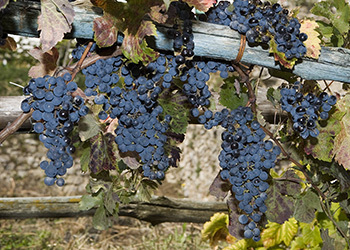 Fenile is a complementary grape variety found mainly in the territories of Furore, Positano and Amalfi. 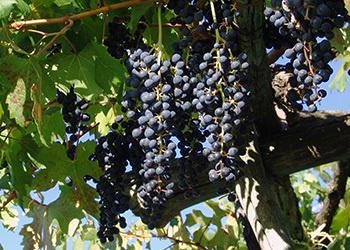 Trained using the pergola system, in groups of two/three vines per position, Fenile offers a modest production due to the slight weight of the bunch. This grape ripens between the end of August and the first few days of September and the very thin skin of the berry means that it must be harvested immediately to prevent it from rotting. It is named after the red colour of the peduncles of the berries, reminiscent of the colour of the feet of doves. 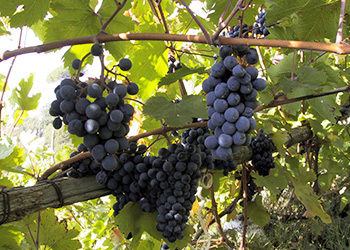 Found mainly in the Naples area, it is also the prevalent grape variety in the Costa d’Amalfi blend. Lacking in generosity in terms of production, it offers a must with a rather high sugar content and quite restrained acidity. These are possibly the characteristics that earn the wine so much praise and its frequent combination with Aglianico. 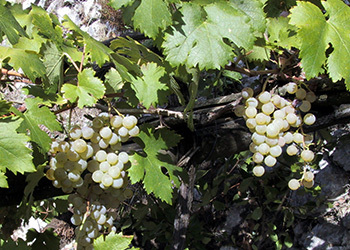 This grape variety is present in Furore, Tramonti, Corbara and Positano and is also known by the name of Bianca Zita. It has nothing to do with Falanghina, with which it was mistakenly combined in the 19th century. It has a characteristically strong scent of broom, the Italian name for this plant being “ginestra”, hence the name of the grape. This robust grape variety requires extensive pruning and offers discreet yields. 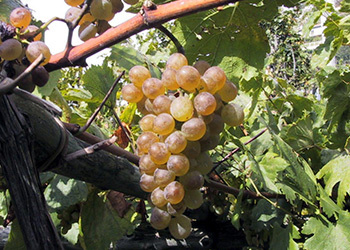 It is a complementary grape variety in the Costa d'Amalfi Bianco DOC. This is another grape variety which is exclusive to the area of Amalfi inland from the coast. The name seems to be linked to its tiny berries, similar in size to peppercorns. These are fairly uncommon and rather old plants. 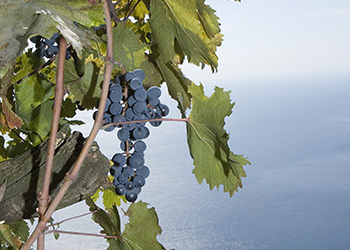 As a complementary grape variety, it falls under the Tramonti and Ravello subzones of the Costa d’Amalfi Rosso DOC. 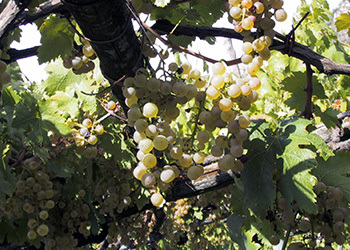 The grape variety has now been monopolised by the municipalities of Furore and Positano, where it is grown in small areas. It is not particularly fertile and production is not always constant. In particular, the weight of the bunch is well below average. It is used as a complementary grape variety in Rosso and Rosato Costa d’Amalfi. The heavy bunches favour good production. The modest level of sugar and quite high acidity create a brightly coloured wine with a particular taste. The name is linked to the colour substance in which the grape is rich. When vinified properly and without the addition of other varieties, it produces a greatly appreciated wine. It is used in the blend of Costa d’Amalfi Rosso DOC, for the Tramonti subzone. 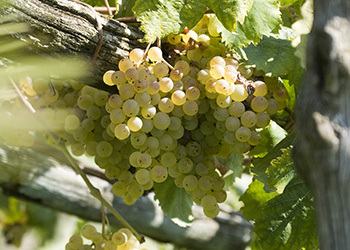 With two or three vines per position, this grape variety is also present in Amalfi and Positano. With complex genetic and morphological aspects, it is currently undergoing study by oenologists to better define its characteristics, which are simultaneously distant and bordering with those of Aglianico. The vineyards in Furore lie on rocks overhanging the sea of the Gulf of Amalfi. Noble wines full of history, they are the magical expression of a place of beauty beyond compare. Vines overlooking the sea of the Gulf of Salerno, from Ravello to Scala, along the fjords that stretch as far as Amalfi, exposed to the magical action of the sun and of iodine. Painted in “guasce”, the typical watercolours of the Gulf of Naples, in vogue from the 1700s, the vineyards clambering on the slopes above the sea characterise the landscape of the Amalfi Coast, which is so fascinating and extreme. They are ancient grapes, full of history, which have made Furore and the territory of Salerno internationally famous: noble bunches recuperated thanks to man’s passion, they offer a wine of absolute excellence.